Shrubs are an integral part of any landscape providing value and seemingly endless uses. Shrubs can provide a natural wind break, act as a screen to block a view, accent rock gardens or berms and provide flowers for enjoyments. 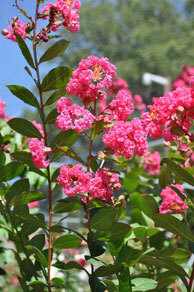 Certain types of shrubs, like hollies, tend to favor sunny conditions while azaleas and camellias prefer shady areas. We can advise you on the best shrub for your particular garden needs.